Our goal was to make it to the lakeside town of Copacabana, Bolivia by nightfall. 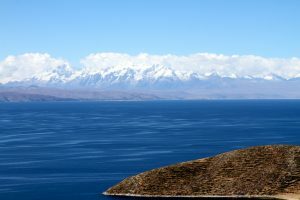 We awoke in Cusco at Eva’s Airbnb and after a delicious breakfast took a taxi to the airport for the flight to Juliaca, Peru, the largest airport near Lake Titicaca. We had planned to take a bus the rest of the way. But alas the Bolivian 16 and under national girls volleyball team who are gearing up for the 2018 South American championship tournament was on the flight with us and one of the girls said, “Hey, you guys ought to come with us in our bus!” since they were headed back to La Paz. The manager agreed and off we went across the Altiplano towards the Lake. We realized about half way there that the road they were taking did not go through Copacabana but they could leave us off on a highway 30 km from our destination. 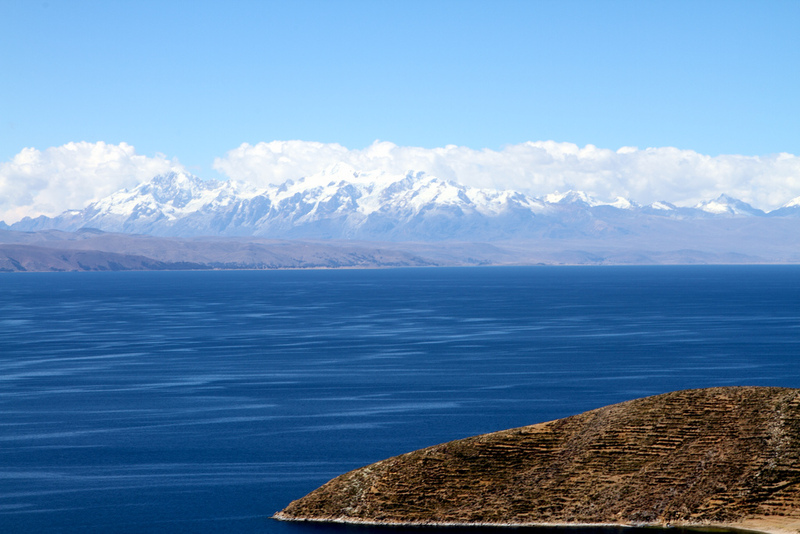 As we near Puno, this is our view of mountains across the Lake. 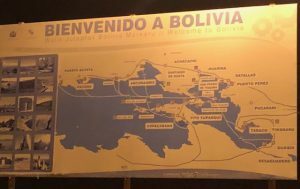 So at the crossroad a car offers to drive us to the border with Boliva for 30 sols (the Peruvian currency). It was a little more than we wanted to pay but dusk was upon us. Twenty-two kilometers later we are at the border. The driver insists he meant 30 sols for each of us which is exorbitant by normal standards. We had a rather heated stand-off with lots of hand gestures (no not those hand gestures) that was beginning to attract the guards at the border. He finally relented. We walk through immigration leaving Peru, a long walk through the border gate, and then through immigration arriving in Bolivia. 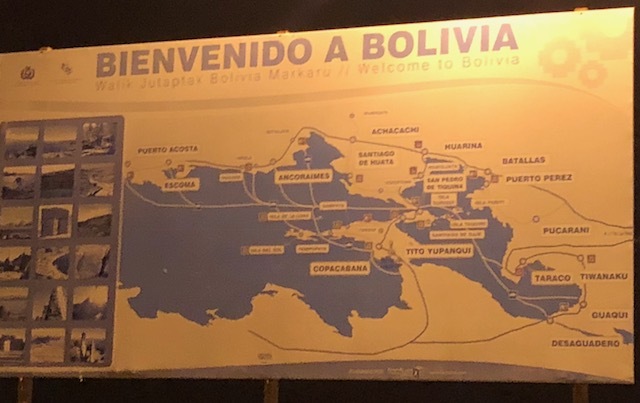 We encountered a small snafu when we learned that Bolivia now requires a visa to enter the country (which they didn’t when I visited in the past). This delayed us about an hour to get it resolved. Another 150 yards we had to walk to a few waiting micros (small buses), one of which carries us to our hotel in town. The day was long and full of different emotions. It felt a little bit like Steve Martin in Planes, Trains and Automobiles where he bumbles his way home to a Thanksgiving with his family. But after dinner, and a short walk back to the hotel, we crashed in our beds for a night of sleep.